Since Daylight Savings was on Sunday, and it's now getting darker sooner, I thought I'd give you all a treat to celebrate the time change. 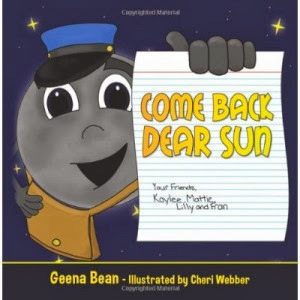 Geena Bean is with me today to share her wonderful book "Come Back Dear Sun". When the sun disappears for a long time, curious Kaylee cannot wait to have the sunshine back. Her imaginative plan unfolds like only an eight-year-old can conceive, and the wonder and smiles begin. She and her six-year-old sister, Mattie, along with their two friends, Fran and Lilly, plan an adventurous sleepover in an attempt to find out why the sun has disappeared. The children figure out a way to talk to the moon only to discover that the sun has left because of the lack of outdoor play. The insightful message of this story impresses both parents and children alike in order to grow appreciation of the world around us. Bean skillfully creates characters which children can easily relate and be inspired by. People will enjoy this wonderful, energetic children’s story with an everlasting message to remember. Parents remember childhood playtime memories as they resurface, and young listeners are enthralled with the thought-provoking questions of “What if?” Follow Kaylee and her friends on their energetic quest to bring back the sunshine to their otherwise gloomy days! Geena Bean graduated from Rutgers University with a degree in English in 2003. Since then, she has been working within the nanny industry and creating children’s books as she experiences them. Bean has been writing since she was in 1st grade and has told many stories and tales over time. While working with kids for over 10 years now, she loves to share her commitment and adoration for story telling with each and every one of them. Her first children’s book, Come Back Dear Sun, was published and released in January, 2013. Since then, she has been visiting schools, libraries, and local bookstores throughout New Jersey in hopes that she can inspire kids to always live up to their full potential by being creative, imaginative, dedicated, and of course, kind. Geena would also like to ask you questions. Take it away, Geena! As a child, I remember begging my parents to stay outside for as long as we possibly could. We would play kickball, jailbreak, swim in our pool, ride our bikes around the neighborhood, make up adventures in our backyard and so much more! QUESTIONS: What are some of your most treasured memories of outdoor play? Do you allow your children a certain amount of time for television, computers, video games, etc.? My most treasured memory from childhood is when I played in my fort. It was made entirely of pine needles and shaped like an igloo. I was convinced that it was magical. And even after a couple of hurricanes, it remained intact. GIVEAWAY: Please leave a comment below for a chance to win a signed copy of Come Back Dear Sun! Spread the word because I am going to be doing a drawing for not just one, but two winners! Good luck and have a playful day! As a kid I had the "Perfect Tree" that I could climb. It was in the front yard and had a Y that I could sit in and pretend anything I wanted. My kids can't watch television or play video games till homework is done each day. Sometimes it is only on the weekend that they get to watch a family movie or some cartoons. Boy, I sound mean don't I. Excellent work, dad! Not letting the kids play video games or watch TV before their homework is done is a great rule that more parents should follow, I think. Thank you so much for hosting the giveaway, Chrys. And thanks to everyone for leaving such kind comments. Best of luck to you all and have a playful week/weekend ahead! Great to meet Geena! And that fort sounds awesome!! I nominated you for a Sunshine Award! Find the questions at http://adriennereiter.blogspot.com. Don't worry. There are that many. ;) Hope you're having a good weekend. Thank you so much, Adrienne! I am incredibly honored. :D I'll post my questions and nominees soon.